Online zombie show The Z Virus is in the end zone for this season and so I hoped for an action packed episode, especially after how the last one ended. I wasn't disappointed, while sometimes the budget is plain to see this was a real thrill ride that was quite a trip. Spoilers for previous episodes are bound to follow. Last episode I commented how it was novel how innocent the group were in regards to the lack of knowledge about what was going on in the world around them. They could be excused for that, yet here it really is brought home in some ways. Every open door and window shown had me shouting at my monitor, it was funny how little time everyone had to adjust, the short length of the episodes (as usual around 9 minutes) added to the panic. Some things felt a bit off though, in particular someone who ends up with a gun and confesses never to have used one before then in the next scene perfectly takes out a zombie that was closely grappling with a fellow survivor from some distance away. Also in terms of story there is a plot point about all the guns being locked up in Alex's bunker so I'm not sure why the gang didn't all decide to head to that obviously more secure location, but that's just nitpicking and having an injured man with them would have caused issues. It had been so long since I had seen a zombie in The Z Virus that I couldn't even recall what the make-up effects were like on them, and so I was pleasantly surprised to find at least the main one in this episode looked great. Also I found the physical effects more enjoyable with melee weapons used, even if you don't get to see the initial contact (just the aftermath such as a nice shot of a ghoul with a machete stuck in his head, and one with an axe embedded). It all ends on a cliff hanger that looks set to lead to a nice conclusion. With all the excitement of zombies finally making a resurgence it would have been hard to mess up episode 5 too much, my hopes for the season finale is that at least one of the group ends up dead; to really hammer home the fact that these undead brutes are a legitimate force to be reckoned with. 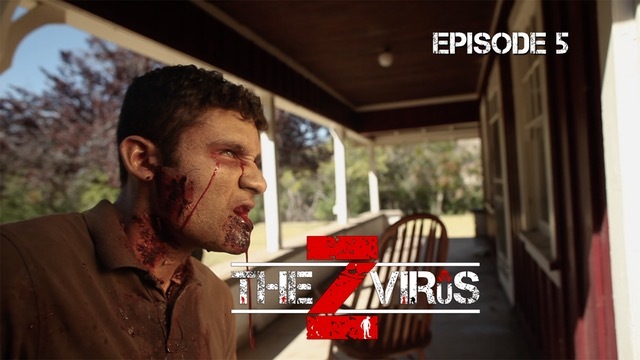 As always The Z Virus can be seen at TheZVirusSeries.com, ScreenMagicTV.com, Amazon Prime, Vimeo On Demand, and on the ScreenMagic TV Roku Channel.